Prison life at Fort Jefferson, Dry Tortugas was a miserable affair. From the food, to the weather, to the living conditions, it’s hard to imagine that anyone stationed there, guard or prisoner, found the now tropical paradise hospitable. All those that sailed to the island fort became prisoners. It appears that when the lives of the inhabitants were not in danger from disease or malnutrition, extreme boredom prevailed. The Lincoln assassination conspirators Dr. Mudd, Edman Spangler, Samuel Arnold, and Michael O’Laughlen fought against this boredom. The assigned duties given to the men helped in some ways. Dr. Mudd, while a trained surgeon who would be a nurse in the hospital and an emergency replacement during the Yellow Fever epidemic, spent a considerable amount of time with Edman Spangler in the carpentry shop on the island. Through three and a half years, he honed his carpentry skills and created several beautiful items that are currently on display at the Dr. Samuel A. Mudd House Museum in Waldorf, MD. One set of items that Dr. Mudd became effective at creating were canes. 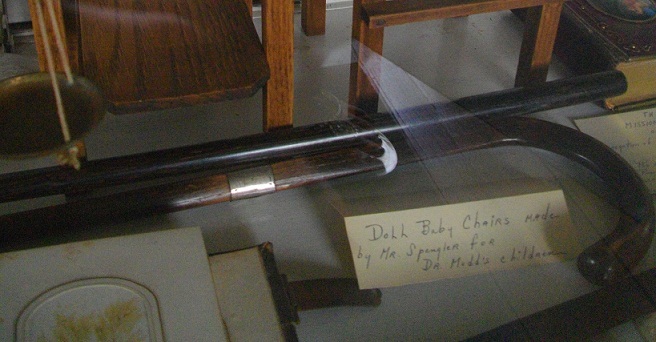 In addition to these two canes on display at the Mudd house, the good Dr. also created a cane for his cousin Henry A. Clarke. When Dr. Mudd was struggling to find an attorney willing to take his case during the conspiracy trial, he reached out to his cousin Henry Clarke who owned a Washington coal company. On May 10th, Col. Henry Burnett sent a letter to Clarke asking if he would be Mudd’s counsel. Clarke responded back truthfully that he was not an attorney but would be happy to help Dr. Mudd in securing counsel. By the time Clarke had responded, Dr. Mudd had already secured Thomas Ewing and Frederick Stone for his defense. The cane Dr. Mudd made for Henry Clarke made its way to Antiques Roadshow a few years ago, and the appraisal for it can be watched here. The canes, cribbage boards, shell decorated boxes, and other feats of craftsmanship were all therapeutic ways for Dr. Mudd to feel productive. Had it not been for these minor, but important, outlets of purposefulness, the Lincoln assassination conspirators could easily have succumbed to insanity. Another fascinating post, Dave. I am one of those who believes Spangler was innocent. I think it was mostly a case of guilt by association (Booth being his friend). In the “The Lincoln Assassination: Crime and Punishment, Myth and Memory” edited by Harold Holzer, Craig L. Symonds, and Frank J. Williams, Ed Steers writes, “The tribunal judges simply did not believe that Booth could have managed to escape from the theater without some sort of help, and the hapless Spangler had provided it.” I don’t think the rope they found had anything to do with anything, and the altercation with Ritterspaugh (if it occurred as Ritterspaugh said) was due to Spangler not seeing the identity of the man who jumped and then darted across the stage. Years later Harry Hawk admitted in an interview that he actually said the words Ritterspaugh attributed to Spangler. 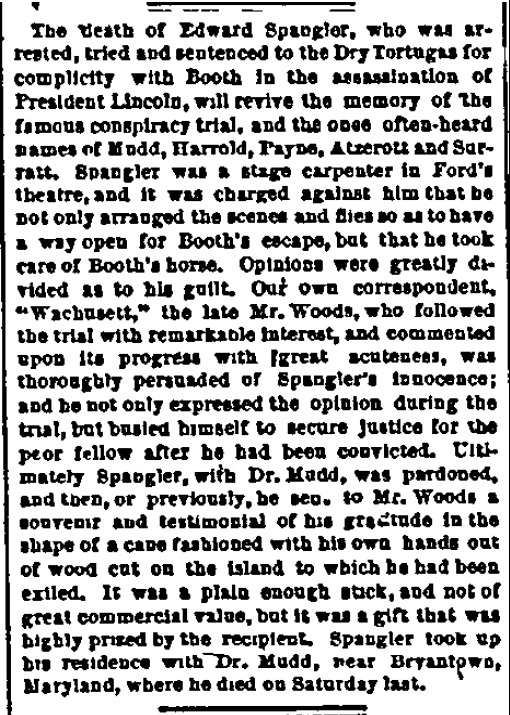 I think Spangler did favors for his friend, Booth but was not complicit in the assassination plan. Just my opinion. At Surratt House, we display a similar cane (they are actually walking sticks) that was made by a prisoner-of-war at the Union’s camp for Confederates in Maryland’s St. Mary’s County. It is not as elegant as Mudd’s, but it is intricately constructed of graduated wooden rings with a rounded wooden knob held together with a round plug of wood. One thinks of the tedious work that it took to construct each of those rings and can imagine the monotony of life in camps such as Maryland’s Point Lookout, which is located on a peninsula of land where the Potomac reaches the Chesapeake Bay. Any idea if the fancy silver heads to this walking sticks were added after Dr. Mudd came home? I just don’t see such materials being available at Ft. Jefferson unless they could be special ordered from the mainland. But would prisoners have such advantages? The quality of these, the inlaid table, and the boxes is exquisite, but I just can’t fathom how the government allowed these heinous criminals the time to produce such fine work. Laurie, I think it’s possible the engraved head might have been added later espeically since it’s dated 1869. But in regards to the other works of carpentry, I think all the items could have been made on the island using driftwood, island trees, and the lumber brought to the island. Since they had a carpentry shop on the island, it makes sense to me that they would keep it stocked with basic supplies. The only ornate items I’ve seen added to most of the doctor’s items have been shells. I should have added quotes around the word “heinous” since that’s what they were considered by many in that time. I am more sympathetic to these men than what I seemed to post here. Also, I just feel that the work done was tedious and time consuming. Perhaps Mudd and Spangler were producing things for the officers and their families as well – or even for sale by those officers on the mainland?